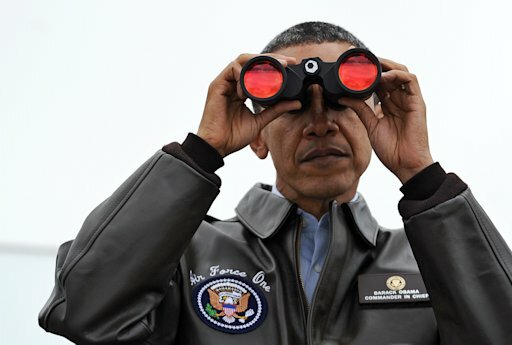 Obama, who is locked in his first showdown with the North’s new leader Kim Jong-Un over a planned rocket launch, stood behind a bullet proof screen four inches thick and surveyed rocky hills and wooded slopes in North Korea. He gazed over a windswept no man’s land between the two nations, split by a brutal Cold War conflict six decades ago, after his armoured SUV took a road through a minefield and tank traps. Then he turned to his left, and looked out across bare fields to a huge North Korean flag — flying at half-mast to remember late leader Kim Jong-Il, who died in December leaving his youthful and untested son in charge. Behind the flag were simple low military buildings, and in the distance a town could just be picked out in the haze, but there was no sign of North Koreans who live hungry, isolated and cut off from the 21st Century. Wearing a brown leather jacket and beige slacks, Obama stood in an open bunker and chatted with senior US and South Korean officers, just as Ronald Reagan, Bill Clinton and George W. Bush did on trips during their presidencies. Earlier, he had told some of the 28,500 US troops stationed in South Korea they were performing honoured service at “freedom’s frontier” and brought news of annual college basketball playoffs from home. The ramparts of Observation Point Ouellette, a UN-commanded post where he stood, is the closest point to the demarcation line in the 250-kilometre (160-mile) long and 4-km (1.6-m) wide Demilitarised Zone. Later, Obama shared his observations with reporters as he held a joint press conference with South Korea’s President Lee Myung-Bak, on the eve of a major nuclear summit in Seoul. And he seemed unable to process the logic of three generations of leaders who had kept their people imprisoned, impoverished and in thrall to successive personality cults. “If a country can’t feed its people effectively, if it can’t make anything of any use to anybody, if it has no exports other than weapons and even those aren’t ones that in any way would be considered state of the art.